NGC 4631 is a spiral galaxy in Canes Venatici. We see the galaxy from the side, so it is considered an edge on spiral. The galaxy earns its nickname from its remarkable resemblance to a swimming whale. This photo shows the dust lanes in the galaxy quite well. 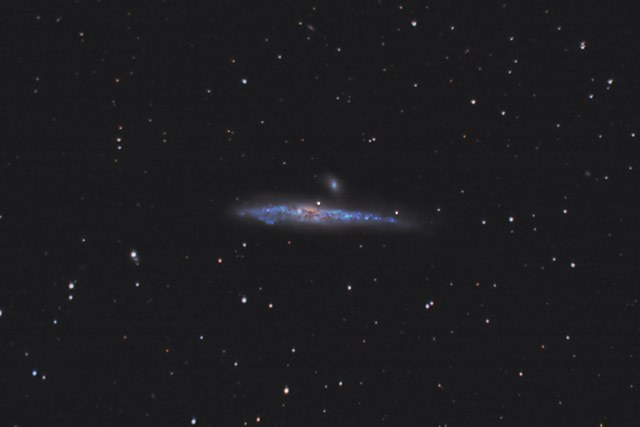 NGC 4631 also has a dwarf galaxy companion, NGC 4627, which can be seen just above the whale galaxy. Close inspection of the enlarged image will show you a number of fainter galaxies. Software Used Images Plus 4.0 for camera control, calibration, stacking, digital development, and multiresolution smoothing. Photoshop CS5 used for levels and curves, color correction, neutralize background, star shrinking, noise reduction, saturation adjustments, and high pass filter. HLVG for additional color correction. Carboni Actions for noise reduction and additional color saturation. Notes I'm quite happy with this exposure. Once again, the telescope had a very fogged secondary mirror, and the collimation needed correction, so the image is not as sharp as it could be. Nonetheless, I learned a bit in processing this photo, and the processed photo shows how much more data can be brought out from the orignal images.